Particle Theme comes with two stunning homepage demos, both of which have the amazing particles effects on the hero sections. Check out our live demo and see why particle is one of the best modern responsive Muse templates ever created. Particle Theme will instantly engage your clients with amazing modern and powerful look. This is the Muse theme full of energy and vibrance, with all elements a great technology muse template should have. It is a multi-purpose Muse template with accent on innovation, technology and creativity. A perfect theme for tech startups! Particle theme is a perfect online presentation of your business. It is ready for launch and as soon as you enter your info you'll have a stunningly beautiful responsive Muse site to be proud of. All smart sections are already created and all effects are set with no need for installation or code knowledge! Particle theme comes with its own "Particle Engine" widget, a collection of amazing effects and animations that were created specifically for this theme. All the effects work instantly so you don't need to worry about coding or installation, leave that part to the Particle Engine! With this theme you get one of our coolest premium Adobe Muse widgets, the Particles Muse Widget! This means you can, along with the two already created effects, create UNLIMITED particles effects and tweak them exactly how you want. We've designed unique Muse image hover effects specifically for Particle Theme. Check out the live demo custom, multi-animation hover effects for the image thumbnails! Additionally, with Particle Theme you get our Typed Text Muse Widget which turns your regular Muse headings into awesome typed-out animated headings! 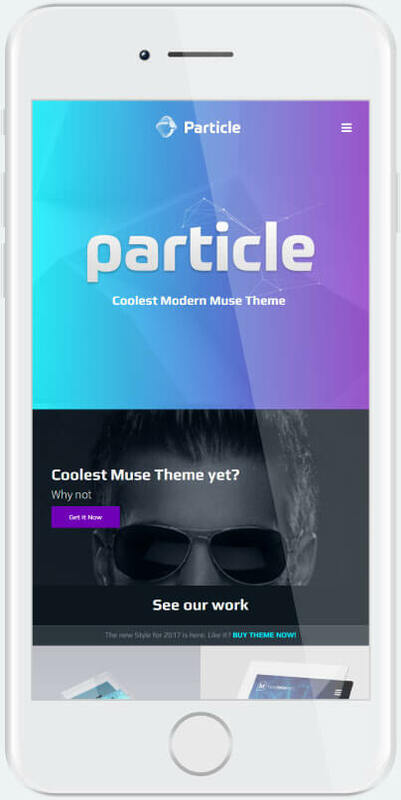 Particle Theme is a fully responsive muse template and adjusts perfectly to all devices! Start creating amazing tech Muse websites today! 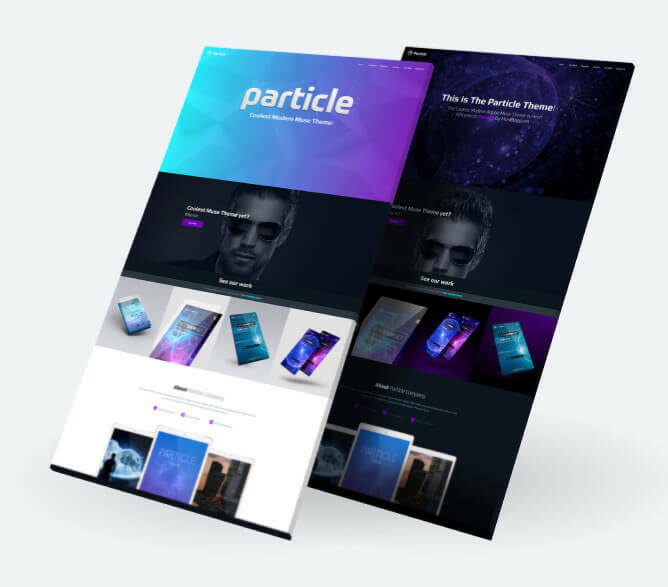 With awesome Muse responsive parallax effects and slick design, Particle Theme is your best choice for a modern Muse website design. PREMIUM PSD & AI MOCKUPS INCLUDED! Particle is also special because you get awesome premium MuseShop.net Photoshop and Illustrator, PSD & AI Mock ups! With these Mock ups you'll instantly generate amazing images for your Muse project. Perfect technology, startup and innovation responsive Muse theme! WOW ! A beautiful theme, love the colors. Particle theme is a perfect online presentation of your business. It is ready for launch and as soon as you enter your info you’ll have a stunningly beautiful responsive Muse site to be proud of. All smart sections are already created and all effects are set with no need for installation or code knowledge! Particle theme comes with its own “Particle Engine” widget, a collection of amazing effects and animations that were created specifically for this theme. All the effects work instantly so you don’t need to worry about coding or installation, leave that part to the Particle Engine! We’ve designed unique Muse image hover effects specifically for Particle Theme. Check out the live demo custom, multi-animation hover effects for the image thumbnails! Particle is also special because you get awesome premium MuseShop.net Photoshop and Illustrator, PSD & AI Mock ups! With these Mock ups you’ll instantly generate amazing images for your Muse project.